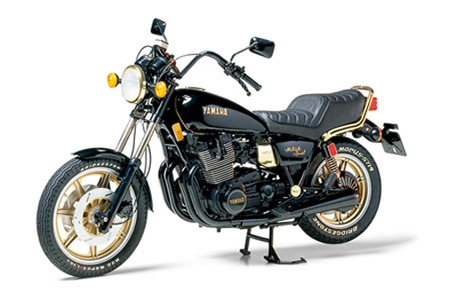 TAMIYA 16034 YAMAHA XS1100 MIDNIGHT SPECIAL (1/6) scale model kit! Here’s a super-big-scale, super-detailed version of this classic Yamaha bike with a massive 1100cc DOHC four-cylinder engine! Wheel and engine detail is done in shiny gold, matte gold, and matte silver chrome-plated plastic. Includes highly detailed semi-pneumatic rubber tires, a front fork made of aluminum, and a sprung suspension that really works. Plastic tubing is provided for control line detail, too. Detachable seat and side covers. Also includes gold-colored metallic transfers and stickers! A must for all bike fans and detail nuts!